Travel between the U.S. and Canada is now more convenient. Flying with Delta and WestJet, whether for business or pleasure, offers an array of travel options to places you want to go with nonstop transborder service. 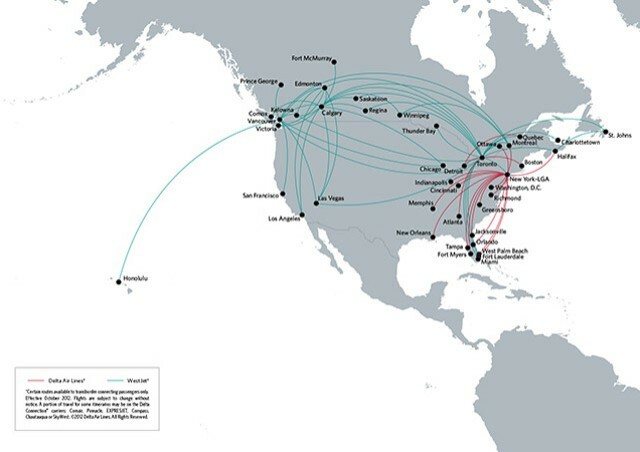 Our complementary networks also provide easy one-stop connections from within Canada to transoceanic flights operated by Delta’s Joint Venture carriers Air France, KLM and Alitalia. For travel agent resources and news, please visit the WestJet travel agency website. For additional WestJet information, please visit their website. For business or leisure travelers in both the U.S. and Canada, Delta and WestJet offer a world of opportunities for travel across the border or around the world with one of the most comprehensive networks. WestJet provides additional transborder service and convenient connections throughout Canada to business centers like Montreal, Toronto, Vancouver and Calgary. Download PDF version of map here. The partnership offers additional benefit to customers in each carrier’s frequent flyer program. Delta SkyMiles members and WestJet Rewards members are able to earn miles or WestJet dollars on all mutually codeshared flights throughout their respective networks. China Southern Airlines, China’s largest airline, is committed to putting the customer first and dedicated to exceeding its customers’ expectations by offering reliable, on-time and convenient quality customer service. China Southern operates the largest and most technologically advanced airline fleet as well as the most extensive domestic air network in The People’s Republic of China. As a SkyTeam alliance member, customers benefit from reciprocal frequent flyer options, lounge access and SkyPriority® benefits. For additional China Southern information, please visit their website.